Danger Danger of poisoning Exhaust gases are poisonous & inhaling them may result in unconsciousness and/or death. - When running the engine, always make sure there is sufficient ventilation, and do not start or run the engine in an enclosed space without an effective exhaust extraction system. Caution Danger of accidents If the vehicle is operated with a discharged battery or without a battery, electronic components and safety equipment may be damaged. - Never operate the vehicle with a discharged battery or without a battery. Engine failure Unfiltered intake air has a negative effect on the service life of the engine. - Never ride the vehicle without an air filter since dust and dirt can get into the engine and result in increased wear. Engine failure High engine speeds in cold engines have a negative effect on the service life of the engine. - Always warm up the engine at low engine speeds. - Sit on the vehicle, take the weight off of the side stand, and move up all the way. - Turn the emergency OFF switch to the ON position. After you switch on the ignition, you can hear the fuel pump working for about two seconds. The function test of the combination instrument is run at the same time. - Shift gear to neutral. The green idling speed indicator lamp N lights up. - Press the electric starter button. Info Do not press the electric starter button until the function test of the combination instrument is finished. When starting, DO NOT open the throttle. If you open the throttle during the starting procedure, fuel is not injected by the engine management system and the engine cannot start. Press the starter for a maximum of 5 seconds. Wait for at least 5 seconds before trying again. This motorcycle is equipped with a safety start system. You can only start the engine if the transmission is in neutral or if the clutch is pulled when a gear is engaged. If the side stand is folded out and you shift into gear and release the clutch, the engine stops. - Pull the clutch lever, engage 1st gear, release the clutch lever slowly, and simultaneously open the throttle carefully. If the engine dies while starting off, only pull the clutch lever and press the electric starter button. You do not need to shift into neutral. Warning Danger of accidents Abrupt load alterations can cause the vehicle to get out of control. - Avoid abrupt load alterations and sudden braking actions, and adapt your speed to the road conditions. Warning Danger of accidents If you change down at high engine speed, the rear wheel can lock up. - Do not change into a low gear at high engine speed. The engine races and the rear wheel can lock up. Warning Danger of accidents Malfunctions caused by incorrect ignition key position. - Do not change the ignition key position during a journey. Warning Danger of accidents Distraction from traffic activity by adjustments to the vehicle. - Make all adjustments when the vehicle is at a standstill. Warning Danger of accidents Falling off of the passenger. - The passenger must be capable of properly holding onto the driver or the grab handles and of keeping his or her feet on the passenger footrests. Note the regulations governing the minimum age of passengers in your country. Warning Danger of accidents Danger of accidents caused by dangerous driving. - Comply with traffic regulations and ride defensively and foresightedly to detect sources of danger early on. Warning Danger of accidents Reduced road grip with cold tires. - On every journey, take the first miles carefully at moderate speed until the tires reach operating temperature and optimal road grip is ensured. Warning Danger of accidents Reduced road grip with new tires. - New tires have a smooth rolling surface and therefore cannot provide full road grip. The entire rolling surface must be roughened in the first 200 kilometers (124.3 miles) by moderate riding at alternating angles. The full grip levels are not achieved until the tire have been run in. Warning Danger of accidents Unstable handling characteristics due to slipped baggage. - Check the way your baggage is fixed regularly. Warning Danger of accidents Lack of roadworthiness. - After a fall, check the vehicle as usual before preparing for use. Engine failure Overheating of engine. - If the coolant temperature warning lamp lights up, stop and switch off the engine. Allow the engine to cool down and check the coolant level in the radiator, and top up if necessary. If you continue with the coolant temperature warning lamp alight, you may have engine failure. If you hear unusual noises while riding, stop immediately, switch off the engine and contact an authorized KTM workshop. - When conditions allow (incline, road situation, etc. ), you can shift into a higher gear. - Release the throttle while simultaneously pulling the clutch lever, shift into the next gear, release the clutch and open the throttle. You can see the positions of the 6 forward gears in the figure. The neutral or idle position is between the first and second gears. First gear is used for starting off or for steep inclines. - Accelerate only up to a speed suitable for the road surface and weather conditions. Particularly in bends, do not shift, and accelerate very carefully. - To shift down, brake if necessary and close the throttle at the same time. - Pull the clutch lever and shift into a lower gear, release the clutch lever slowly and open the throttle or shift again. - Switch off the engine if you expect to be standing for a long time. - If the engine diagnosis warning lamp lights up during a trip, stop immediately, switch off the engine, and contact an authorized KTM workshop. Warning Danger of accidents If you brake too hard, the wheels can lock. - Adapt your braking to the traffic situation and the road conditions. Warning Danger of accidents Reduced braking efficiency due to wet or dirty brakes. - Clean or dry dirty or wet brakes by riding and braking gently. Warning Danger of accidents Reduced braking efficiency caused by spongy pressure point of front or rear brake. Warning Danger of accidents Longer stopping distance due to higher overall weight. - Take the longer stopping distance into account when carrying a passenger and baggage. Warning Danger of accidents Delayed brake action on salted roads. - There may be salt deposits on the brake discs. In order to restore the normal braking efficiency, you will need to remove deposits from the discs by carefully applying the brakes. - When braking, release the throttle and apply the front and rear brakes at the same time. - On sandy, wet, or slippery surfaces, use the rear brake. - Braking should always be completed before you go into a bend. Change down to a lower gear appropriate to your road speed. - On long downhill stretches, use the braking effect of the engine. Change down one or two gears, but do not overstress the engine. In this way, you have to brake far less and the brakes do not overheat. Warning Risk of misappropriation Usage by unauthorized persons. - Never leave the vehicle while the engine is running. Secure the vehicle against use by unauthorized persons. If you leave the vehicle, lock the steering and remove the ignition key. Warning Danger of Burns Some vehicle components become very hot when the vehicle is operated. - Do not touch hot components such as exhaust system, radiator, engine, shock absorber and brakes. Allow these components to cool down before starting work on them. Danger of damage The parked vehicle may roll away or fall over. - Always place the vehicle on a firm and even surface. Fire hazard Some vehicle components become very hot when the vehicle is operated..
- Do not park the vehicle near flammable or explosive substances. Do not place objects on the vehicle while it is still warm from being run. Always let the vehicle cool first. 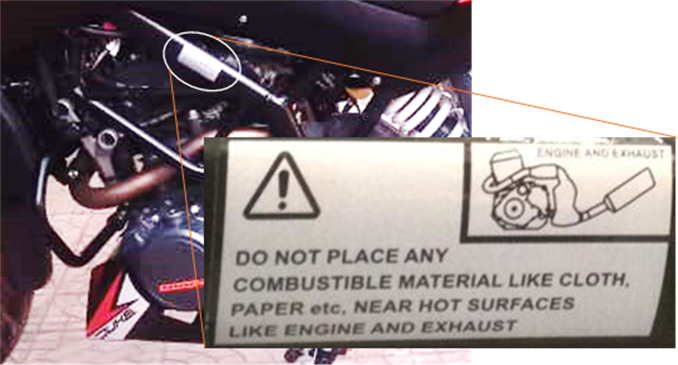 - Do not keep any combustible material / cleaning cloth near Silencer or Engine Area as it may catch on fire due to high temperature. Material damage Damage and destruction of components by excessive load. - The side stand is designed for the weight of the motorcycle only. Do not sit on the motorcycle when it is supported by the side stand only. The side stand and/or the frame could be damaged and the motorcycle could fall over. - Switch off the ignition by turning the ignition key to the position. Info If the engine is switched off with the emergency OFF switch and the ignition remains switched on at the ignition lock, power continues to flow to most power consumers and the battery will discharge. You should therefore always switch off the engine with the ignition key - the emergency OFF switch is intended for emergencies only. - Park the motorcycle on a firm surface. - Swing the side stand forward with your foot as far as it will go and lean the vehicle on it. - Lock the steering by turning the handlebar fully to the left, pressing down the ignition key to position and turning it to position. To make the steering lock engage more easily, move the handlebar a little to the left and right. Remove the ignition key. Danger Fire hazard Fuel is highly flammable. - Never refuel the vehicle near open flames or burning cigarettes, and always switch off the engine first. Be careful that no fuel is spilt, especially on hot vehicle components. Clean up spilt fuel immediately. Warning Danger of poisoning Fuel is poisonous and a health hazard. - Avoid contact of the fuel with skin, eyes and clothing. Do not inhale fuel vapors. If fuel gets into your eyes, rinse immediately with water and contact a doctor. Wash affected skin areas immediately with soap and water. If fuel is swallowed, contact a doctor immediately. Change clothing that has come into contact with fuel. - In some countries and regions, the available fuel quality and cleanliness may not be sufficient. This will result in problems with the fuel system. (Your authorized KTM workshop will be glad to help). - Only refuel with clean fuel that meets the specified standards. Warning Environmental hazard Improper handling of fuel is a danger to the environment. - Do not allow fuel to get into the ground water, the ground, or the sewage system. - Open the filler cap. - Fill the fuel tank with fuel up to the lower edge Ê of the fuel tank. Total fuel tank capacity (approx). For stringent environmental pollution control, Duke 250 is equipped with EVAP System. The Evaporative Emission Control System (EVAP) is used to prevent gasoline vapors from escaping into the atmosphere from the fuel tank and fuel system. EVAP systems is required because gasoline fuel vapors contain a variety of different hydrocarbons (HC). These substances react with air and sunlight to form smog. Uncontrolled evaporative emissions like this can account for as much as 20 percent of the pollution produced by a motor vehicle.The EVAP system totally eliminates fuel vapors as a source of air pollution by sealing off the fuel system from the atmosphere. Vent lines from the fuel tank route vapors to the EVAP storage canister, where they are trapped and stored until the engine is started. When the engine is warm and the vehicle is going down the road, the ECU then opens a purge valve allowing the vapors to be siphoned from the storage canister into the intake manifold.The fuel vapors are here burned in the engine.